mbaMission: First, let me start by thanking you for talking with me today. We appreciate it. Some have been saying that the Yale School of Management [SOM] is losing its reputation of being quirky and untraditional and instead becoming more Wall Street, more corporate. Would you agree with this, and if so, does it change the kind of student you’re trying to attract? Bruce DelMonico: I’ve heard that over the past year or two—concerns about the culture changing or losing the school’s character—but actually, I don’t agree with that assessment. From the admissions perspective, first of all, it hasn’t changed anything in terms of what we’re doing or who we’re hoping to attract. I haven’t seen changes in terms of the composition of the incoming students. I think if anything, in terms of that first job after graduation, the shift may be a little bit more toward consulting. I think that’s probably consistent with what other schools are seeing. I don’t think that’s a sign of anything large or any major deviation from our culture or mission, or from the character of the school. I think that remains intact. mbaMission: Great. The school has seen a pretty steady increase in application numbers over the past couple years. What do you believe is driving this increase, and what effect has it had, if any, on how you evaluate candidates? And what’s been the effect on selectivity? BD: That’s a good question. I think you could even go back farther and say that over the past decade, there’s been an increase. I’ve been at the school for 11 years now, and when I started, we received somewhere around 2,000 applications. Now we receive somewhere around 3,500. So, in my time, there’s been about a 70% increase in the number of applications we receive, which is a big jump. And I think there are a number of things behind this. I’d like to think that some of things we do in admissions have helped, but there have also been changes on a larger scale—the introduction of the integrated curriculum, Dean [Ted] Snyder’s arrival—a lot of momentum that’s been happening, so really sharpening our focus, deepening our integration with the university, expanding our global presence and our global aspirations, really working to continue to refine our integrated curriculum, and then things like Evans Hall, our new campus, have helped us or garnered attention. I think all those things have contributed to the growth of our applicant pool. As for the selectivity, we’ve been roughly in the same range over the past few years, because as we’ve grown the pool, we’ve also grown the class size. We used to be in the low 200s in terms of the class, and now, we’re in the low 300s. So the class has grown to a large degree in parallel with the applicant pool, and I think that’s held the selectivity consistent. In terms of the evaluation process, we obviously have more files to go through. But we of course want to maintain the quality of the process and not cut corners. We have more people reviewing, so that’s helped, but some of it is just simply working a little harder. We definitely evaluate more files in a week than we had previously, but we don’t want to devote any less time to them. We actually have a consensus-based process, which means we all sit down as a committee and have to be in agreement on the outcome of the files, of the applicants. Naturally, that has taken more time as the pool has grown, but we’ve been able to manage it. I’m a believer in that consensus model, so that’s something we’ll stay with. mbaMission: That does seem like it might slow the process down a bit, having a whole group making the final decisions, rather than just one or two people. BD: It does, but my belief is that it yields a richer outcome, and we make sure that we’re balancing, so that everybody brings a different perspective. I think that’s an important part of the process. mbaMission: Sure. With the increase in applications, do you feel you’ve also seen an increase in quality, for a lack of better word, in the applicants you’re getting, or are you just getting a greater number of the same-level candidates? BD: My sense is that it’s more the latter than the former. We’ve always received really, really strong, high-quality applications, and we continue to. So I don’t know that qualitatively, there’s been at the top end a huge increase in the quality of the pool. What we’ve seen is that there have been more of those high-quality applicants, if that makes sense. I don’t think the quality of the top end has gotten any stronger, but the depth maybe has gotten a little bit deeper. I think that’s obviously a good thing for us. mbaMission:Got it. You regularly offer applicants the advice of being themselves in their application, rather than trying to be whatever they think you or the admissions committee wants them to be. How do you know when someone is not being genuine in their application? Are there certain tells? BD: Maybe there are people who are so good at it we can’t tell! But we do tell people to be themselves, and I know other schools do as well, and we do it for a good reason. We want to get a sense of who you really are. I’ve used this analogy in the past, and hopefully, it’s a helpful one, but my professional background is that I’m a lawyer, so I was a litigator. And when you’re preparing someone for a deposition or for trial, the first thing you tell them is to tell the truth. And there are two reasons you do that: one is that it’s right thing to do, and then the second is that it’s much easier to remember the truth. And I think that applies in the application process as well. What we’re looking for as we’re evaluating candidates is to make sure that everything kind of fits together, which isn’t to say that it has to be entirely consistent across every element of the application, that it’s all uniform. But when you say one thing in your essay about what you’ve done and what you’re interested in doing, and then your recommenders say something completely different, and your academic record and professional background show something else, those are the things we see as potential tells that you’re trying to present yourself as someone other than who you are. So that will raise a red flag for us. By telling the truth and being yourself, you’re not presenting multiple selves to different schools, and you don’t have to keep track of “What did I say to this school?” and “What did I say to that school?” I think there’s a sense that some schools are finance schools or marketing schools or nonprofit schools or operations schools, and therefore you need to be a finance person or a marketing person or a nonprofit person or an operations person to each of these schools. I don’t know if that ever was the case in the past, but I know that certainly at Yale and every other school, the admissions offices are looking to put together a very diverse class, so you don’t have fit any one particular model or mold. BD: But when you start to sort of shape your candidacy to fit the school—I mean obviously, you might highlight certain aspects of yourself to different schools, based on what you think might resonate more with them—but if you go too far in that direction, you start to seem insincere or not terribly genuine, and that’s where the red flags come in. So, if you have always been in finance and now you want to go into nonprofit, well, did you ever volunteer? Did you ever do anything in the nonprofit space? Where is that interest coming from? Or if you have always been in the nonprofit space and want to go into finance, where is that interest coming from? What’s behind that? If we see a disconnect there, that’s where we question that aspect of the candidacy. But even when we see that, that doesn’t automatically mean we’re not going to admit that person. Sometimes we’ll see a candidate who says, “I have these goals,” but we’ll look at their profile and get the sense that they’re saying that because they think that’s what they need to say. We might still admit them, and they might think they got admitted because they said that, but actually, they got admitted despite having said it. We recognize that they’re maybe being a little cute with the application, but we still find their application compelling, and we’re willing to overlook that. mbaMission: Okay. So what would you say to someone who thinks, “I can’t just be who I am in my application because I’m too boring,” or, “I don’t have anything impressive to say, so they won’t notice me”? What advice would you give someone like that? BD: That’s a good question. I have to say that if your goal is to stick out and be unique, no one else will have the same experiences you have, and even if you say, “I’m boring” or “My career path has been too straightforward,” the way to stand out is to discuss what you did there, how you distinguished yourself. We’re looking for people who have a range of different backgrounds, but the thing that really makes them stand out is that they really sell what they’ve done. So if you maybe have what you think is a traditional MBA background, and you don’t stick out in terms of where you’ve been, the way to stick out is by focusing on what you’ve done. That’s really what will get our attention. mbaMission: Sure. 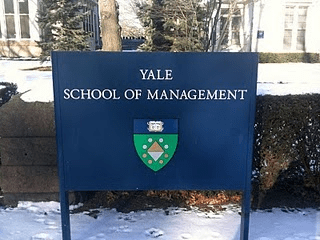 If you were to speak to someone who had just decided to go for their MBA and hadn’t done any research at all on any of the top schools, but you could tell them onlyone thing about Yale, what would be your selling point? BD: No pressure! Okay, I won’t be evasive and say, “Well, I couldn’t pick just one.” If I really could give only one thing, I would say that we’re a school where the mission matters. Our mission is to educate leaders for business and society, and we really care about that mission. We care about living up to that mission. It’s very broad, it’s very multisector, and it’s the founding mission. It’s been the same since the school was founded back in 1970s. It very much still guides what we do at the school. So, that is the one thing I would tell someone who is just coming to the process and just learning about SOM. mbaMission: Nicely done! What guidance can you give someone who finds him- or herself on the waitlist? And why might someone end up on the waitlist in the first place? BD: People can end up on the waitlist for a number of different reasons. We might really like their candidacy, but there might be one thing we have a question about or one thing we feel they need to strengthen. It could be something very specific, or it could just be that it’s a very competitive applicant pool, and they’re strong, but we want to have a better sense of how the pool and the class are going to shape up before we make a final decision. They might be on the waitlist really just because of the competitiveness of the pool. We do also sometimes waitlist people without interviewing them, and I think that sometimes freaks people out, so just to let people know, that’s not the norm, but it’s not so uncommon that you should be concerned. If you didn’t get an interview but then find yourself on the waitlist, sometimes that can be a sign that there might be one thing that we have a question about or something we want to get a little more clarity on. The advice I would give, I think the main thing is that if you find yourself on the waitlist, when you get the decision, we will give you a list of FAQs that tells you, here are some next steps, here’s what you can do, and the first thing we say is to reach out and ask for feedback. We have an email address you can use to request feedback, and it surprises me the number of people I speak to on the waitlist, when I ask whether they asked for feedback, they say no. In my mind, that should be the first thing you do. We’ll tell you why you’re on the waitlist. We’ll tell you what we think you can do to improve your candidacy, to strengthen yourself and strengthen your chances of getting in. But there are people who don’t take advantage of that opportunity. So, the first thing is definitely ask us why you’re on the waitlist. It might be that it’s a very competitive year, and that’s all we can say, or there might be something very specific we can tell you that will help. The other thing is to continue to be in touch, but obviously, in appropriate ways and at appropriate times. If you have a major update, let us know. If you want to just check in every so often, that’s fine, too. But there are some people who are in touch several times a week. I would not suggest that; that’s what can distinguish you in a not-so-positive way. But every two weeks or once a month, if you want to check in and see how things are going and just reiterate your interest, that is always helpful to us. It’s always good for us to know that you remain interested, you want to continue to be considered, and that could be a helpful thing just by itself. mbaMission:Sure. Is there an end date for the Yale waitlist, or do you keep accepting candidates more or less up until the last minute? BD: It depends on the year. We can accept people sometimes up to the very last minute. We try to give people some sense of what the time frame is, but it depends on how things evolve on our end. We try not to keep a huge waitlist going into the summer, for example, just because it’s not fair to people to leave them in limbo for that long. So we try to have a somewhat more targeted waitlist. And every so often, at various points, we’ll reach out to see if you are still interested, so we know that if we get to the point where we’re thinking about making additional offers, we have a current list of people who are still interested and people who aren’t anymore. mbaMission: That makes sense. As you know best, Yale has accepted the GRE in addition to the GMAT for quite a while now. How would you compare the two exams from an admissions perspective, and if you were to recommend that an applicant take only one or the other, which one would you suggest? 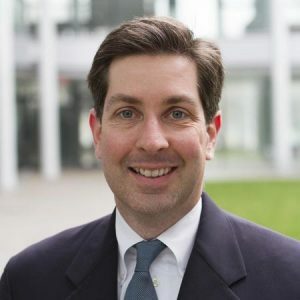 BD: Right, we have accepted the GRE for a number of years, and I think at this point, roughly 20% of students in our incoming class took the GRE as opposed to the GMAT, which I think is probably on the higher end among schools. We have no preference for one or the other; we value them equally. I think it would be a little perverse for us to accept both but then weight one more heavily than the other. We wouldn’t want to disadvantage anybody either way. In terms of recommending taking one or the other, I really think it’s a matter of personal preference, which one you feel more comfortable with. We look at them the same, and we incorporate them into the process the same way. There’s actually a concordance tool that ETS offers to help us better understand how the scores align. It’s a little bit broad, but it’s narrowed since the first inception, so it gives us a decent sense of what the corresponding score might be. We also have now a number of years of students who have come through and taken the GRE, so we’ve done our own regressions and analyses and have a better sense of how to view the tests. So, I think from the applicant perspective, it’s really just which one you feel more comfortable with. A lot of our applicants who have taken the GRE are interested in perhaps a joint degree with another school—so forestry and environmental sciences, for example, or public health—and they want to take just one test as opposed to two, and that’s fine. Or maybe they’re thinking about other graduate schools, not just business school, maybe something like public policy school, and the GRE has more flexibility in that regard. But it’s really a matter of personal preference. mbaMission: Okay. What was your primary motivation for adding the video component to the Yale application, and what information or insight do you feel you get from the video question that you don’t get from the other parts of the application? BD: We actually first piloted the video component in I think 2011, so it’s been several years since we first started playing around with it. And it came about from a conversation we had internally. I was talking to a colleague who has now moved on, and we were talking about how admissions offices really hadn’t incorporated technology in what we thought was a very beneficial way, things like video essays or having applicants upload some sort of multimedia presentation. We didn’t feel as though that was really taking advantage of the technology as much as it could, and it wasn’t really leveraging the benefits of the technology. At the same time, we felt that some of the formats might advantage people with more resources. They would be able to put together more impressive packages or have more advanced technology available to them. So we were thinking about what kind of technology we could use that would level the playing field but also give us really good insights that we wouldn’t be getting in other contexts. That’s where the video questions came about. Again, I think we piloted it in 2011. We played around with different vendors and different formats to get to where we are now, and I think it will continue to evolve. In terms of what we’re hoping to get out of it, at the basic level, we want to get a sense of someone’s speaking ability, especially their English ability if they’re a nonnative speaker. Actually, in tandem with incorporating the video questions, we eliminated the TOEFL and the IELTS requirements, so no English language test, because we felt we could evaluate that directly ourselves. Beyond that, we wanted to get a sense of how well someone can think in the moment, so that extemporaneous speaking ability, which is a little bit beyond basic English ability and can show how well you think on your feet, because that is a skill that is tested and needed in business school and beyond. We do focus some of the video questions on certain different competencies that we think are important. We’re still working on building that part in terms of really structuring the questions and coding the responses in a way that we feel is helpful to us. That’s where I think a lot of the evolution will be. But we do feel that the video question provides a perspective on the applicant that we can’t get just from the paper application. It provides a new dimension, a new aspect to the candidacy, and I can say that we tend to view it almost invariably as a positive. It’s very rare for the questions to be a negative in someone’s application. More often it’s the case that it will allow us to see something new and maybe be even more interested in the candidate than we were before, so I think it’s overall positive for the applicants. mbaMission: I’m sure that will be very reassuring to any candidates who may be worried about the video component. BD: I think that’s the thing that when I talk to people, they’re the most nervous and the most apprehensive about, and the advice I tend to give people is, first of all, we don’t expect perfection—nobody does it perfectly—and second, you invariably did better than you thought you did. I think people are just really nervous about it. mbaMission: Absolutely. Do you recommend that candidates apply in any specific round? Is one better than the other? BD: We really don’t. We model to admit the same quality of students in each round, so it’s not as though there’s an advantage to applying in one round versus another. We have three rounds, and we’re also part of the Consortium for Graduate Study in Management, so we do receive applications that come in through the consortium and that are referred to us. But in terms of our three direct application rounds, like a lot of schools, we counsel people that if they can avoid the third round, they should try to do that. That’s not because it’s inherently any more difficult, but just because it’s more variable. It depends on how many people have already been accepted into the class in the first two rounds, so you just don’t know. It could be more than we were expecting, or it could be less. It’s that uncertainty that can make it more challenging. The main piece of advice we give everybody is to apply when you have your strongest application ready. Don’t rush to get it in earlier if it’s going to be less strong. And especially between rounds one and two, as I said, we model so that the quality of people we’re admitting stays constant throughout, so there’s no advantage in applying in one round versus another. mbaMission: That’s helpful. What can reapplicants do to improve their chances the second time around? Those people who don’t get into Yale this year, what advice would you give them about trying again next year or the year after? BD: This is similar to what we tell people in terms of the waitlist. People are not successful for different reasons, so it’s not just one thing that each person can do; it’s really specific to an individual. And again, like with the waitlist, we’ll give feedback to applicants who are not successful. We do it over the summer, after the admissions season has wound down, in June, typically. We will provide feedback to anybody who was denied admission, and that’s really where you can get a sense of what you need to do to strengthen your candidacy, whether we felt you needed a little more professional experience, or we needed better evidence of your quantitative abilities, or any number of other things. We can give you that feedback, and that can help guide you as you think about strengthening your application for that reapplication. One other thing is that we run the numbers every year, and the admission rate for reapplicants is actually the same as for first-time applicants, so it’s definitely not the case that we have any sort of bias or prejudice against reapplicants. We definitely encourage them, and we definitely do admit people who have reapplied. mbaMission: That’s great. When you say you give feedback, what’s the format? Over the phone? BD: We’ve tried different formats, and right now, we do it by email. We find that’s the most helpful way to do it. mbaMission: Okay, thanks. Can you share any stories of outstanding applications or interview performance from the past couple years? What is something a candidate did or said that really stood out to you? BD: That’s such a tough one for a few reasons. One, candidacies are so different, there’s no template for it—you know, this person did this, so if you do that same thing, you’ll be successful. And I feel as though with things like interviews, for example, a lot is based on the relationship, the give-and-take between the interviewer and the interviewee, and that can vary from person to person, which I think makes the interview especially challenging. I can’t think of any particular things or stories that stood out. One thing, and again it comes back to sincerity, is people acknowledging weaknesses but then explaining them and what they’ve learned from them and what they’re hoping to improve on. If you’ve done that well, it definitely stands out. I find that, if done well, it can be incredibly compelling. So it’s not just constantly touting your successes and how great you are, but stepping back, having a little bit of perspective, a little bit of self-awareness and incorporating that into your reason for wanting to get an MBA or using it to show your growth and development. I find that I’m often drawn to and rooting for those candidates who show that kind of self-awareness, that sense of humility, that desire to grow at business school and beyond. mbaMission: That makes sense. What is a part of the application process that you would like to see applicants spend a little more time on or maybe take a little more seriously? BD: That’s another tough question, because every application is so different, and the weak points tend to differ for each person. Obviously, we’re looking for lots of different qualities, and we’re looking for lots of different competences as we evaluate candidates for the program. And this is an across-the-board kind of thing, but one thing we do look at is quantitative ability. All business schools have some quantitative component in the course work, and obviously, we’re ultimately looking to admit people with long-term professional success, but we also want to make sure they’re able to keep up and do well in the more immediate term, during their two years in the program. And one thing we see sometimes is applicants who maybe haven’t demonstrated that quantitative proficiency through their course work, their testing, or their work experience, or some combination of the three. We look at all those three together. And I think where people don’t take advantage of the opportunity to strengthen their profile is by either not acknowledging that they might not have that exposure or as much exposure as they could, or by acknowledging it but not doing something about it—telling us, for example, “If I’m admitted, I will take statistics and microeconomics.” What we would like to see is you acknowledge it and then actually be proactive in taking those courses to show you have the ability and the preparation to be able to keep up. That’s just one of a number of different things I could point to, but that’s one I think we see probably more often than some others. mbaMission: Got it. Thank you again for bringing us up to speed on the Yale program and admissions process. BD: No problem! Happy to talk. The following Yale MBA interview questions and report were submitted to Clear Admit by a Round 2 applicant. Good luck to them! 1.) Why you this is the right time for you to do MBA? 2.) Tell us about a time when you had to maintain your calm. Describe the situation and how you handled it? 3.) “Globalization can be effective only when companies do not have to worry about health, environment, and employees”. Agree of Disagree?